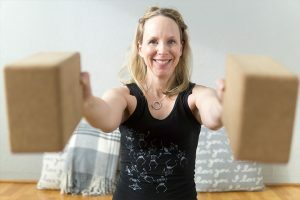 If you are curious about how to get more creative about using your yoga blocks then this yoga video is for you. Also just a quick note to remind you to always press show more below the video because that is where I leave you lots of extra goodies in the show notes that you should definitely check out. Back in June of 2015 I created a whole full-length class for you to have fun with blocks, so I will put that in the show notes for you. Today, I am going to show you how to use your yoga blocks to do crow pose, for upper back and shoulder pain, and a cool yoga block trick for a great ab workout. If you are a yin loving, restorative yogi like me, your abs and upper body strength might be a little lacking for crow pose. This sequence with the blocks can help you build to crow pose. Place your shins on the blocks and keep your toes off the ground. Pull up through your pelvic floor and draw back through your navel. Your hands are under your shoulders. If your wrists are bothering you, come up onto fists. This will help to build the core strength and abdominal strength you need for crow pose. Place the blocks on the lowest setting. Draw your knees right up under your shoulders. Come up onto your tippie toes on the blocks. Breathe and feel your upper body and core strength. Over time you may be able to lift both toes off the block. Benefits of Crow Pose: Builds Strength in your arms, inner thighs and abs. Creates focus. Place one block on the lowest setting: this is going to be for your head. Place one block in front of it on the highest setting: this is going to be for your hand. Inhale lift your left arm and rotate your body to the left side, lower your left shoulder to the ground, rest the left side of your head on the block and your right arm will extend so that your hand rests supported on the block. Benefits: Releases your shoulders, chest, arms, upper back and neck. If you carry a lot of tension in your upper back between your shoulder blades, then you are going to love this yoga pose. Choose and appropriate height for your block. Start on all fours. Keep your legs at a ninety degree angle to the ground. Place your elbows on the blocks and soften your heart towards the ground. Benefits: Opens the shoulders. It is a back bend for your middle and upper back. Softens your heart. Place your right hip on a yoga block on the lowest setting nad your right elbow directly under your right shoulder on the ground. Draw in through your navel and up through your pelvic floor. On an exhale, keep your legs glued together and lift your legs off the ground. Hold and breathe for 1 minute. Benefits: This variation on a side plank will activate your obliques and your quadratus lumborum. It will also strengthen portions of the iliopsoas. We have Jill Miller to thank for this exercise. If you are looking for more then enter your email address below and I will send you 8 days of back pain help with yoga! I will send you 1 video a day for 8 days with the best of yoga, ayurveda, self massage and pranayama (or breath practices) to help your back. If you made it all the way to the end of the video, put ¨great ideas for a yoga block” in the comments. Thank you so much for pressing that like button. If you know somebody who would benefit from this video, please share it with them. Remember to subscribe so you can get our video tomorrow on How to Use a Yoga Bolster.